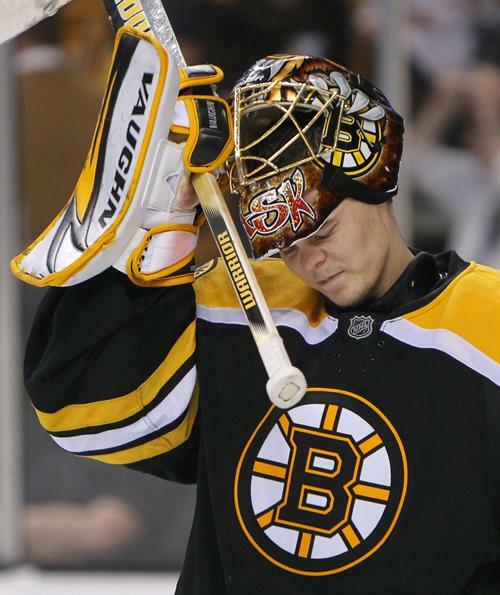 Let’s get the record straight; Tuukka Rask is not responsible for the Bruins putrid start. The Boston Bruins were a wreck before the season even started. Captain Zdeno Chara went down with an upper body injury, Seidenberg had to have surgery, and the Bruins defense was being spearheaded by the Torey Krug-Adam McQuaid pairing. Fast forward to today and Joe Morrow is on the IR, Brad Marchand has a concussion, and yet another AHL defenseman is being called up to fill the roll of, what appears to be a defense made of swiss cheese so far this season. The Boston Bruins are circling the drain; they’re 0-3 for the first time since the ’99 season and have scored 7 goals to the 16 they let up. There’s a lot of talk about Tuukka not receiving enough of the blame for letting up “soft goals,” people think that because he is a $7 million/year goalie that he is supposed to magically bail out the Bruins each game. Newsflash, a great goaltender is only as good as the defense put in front of him. Patrick Roy had Foote, Chelios, Robinson, Blake, Bourque, Ozolinsh, Ludwig, etc. Martin Brodeur had Neidermayer, Stevens, Daneyko, Madden, Rafalski, Commodore, Oduya, Greene, etc. Ken Dryden had Robinson, Lapointe, Savard, Nyrop, Bouchard, Tremblay, etc. Tuukka has Krug, McQuiad, Cross, 37 year old Chara, Colin Miller, Trotman, and Kevan Miller. In other words, Tuukka has ZERO help on the blue line. For those who blame Tuukka for the 2009-10 collapse remember it was Krejci going down with injury that was the turning point of that series. In 2012-13 against the Blackhawks it wasn’t Tuukka’s fault for the 2 goals in 17 seconds, watch as Ference and company play flat footed and wait back while Bolland comes in and nets the game winning goal. Tuukka is not to blame, the front office is to blame. The Boychuk trade looks just as bad now as it did when they pulled the trigger on it, the Seguin trade leaves us still scratching our heads, and the Hamilton trade was for too little. The Bruins should have fully embraced the rebuilding years and traded away Chara/Seidenberg, bought out Chris Kelly, let McQuaid walk or sign him to a better contract, trade Hamilton for what he was worth (not pennies on the dollar), and traded up in the draft (reports said they never made a call to try and get Boston College alum and consensus best defensive prospect Noah Hannifin). Instead Cam Neely comes out and lies to the fans, saying he believes this year they will contend for the playoffs and that the Stanley Cup is their goal, it’s always their goal every year. How exactly do they expect to make the playoffs when every other team beefed up their teams and you took a step back, let Oduya and Franson leave town without an offer sheet, and signed a depth defenseman (who has since been waived) and signed a power forward who has had 1 (yes, really 1) good year. The blame belongs solely on management for putting this product on the ice. The season may be young, but the Bruins failed to make the postseason last year with a better team than they have this year. This year they have no defense, no depth at defense, and so far a lack of scoring. The expectations should be at an all time low.